As some of you may remember, the popular high risk payment gateway, NMI used to be supported through Shopify. Unfortunately, this is no longer the case for new Shopify stores. Shopify still, as of this post, supports NMI for existing merchants, but it does not support the gateway for new sites. A solution to the NMI Shopify problem. The solution is a 3rd party cart. This solution also avoids the added fees that Shopify charges when using a 3rd party gateway, making this solution even more affordable than it may seem at first. Shopify is still, without a doubt, one of the best e-commerce platforms out there. While they offer their out-of-the-box Shopify Payments for payment processing, they’re also compatible with over 100 third-party payment gateways. However, none of these payment gateways facilitate a simple one-login system that manages multiple merchant accounts as NMI does. This is a problem since many merchants need, or want, to use multiple merchant accounts or simply prefer the features and flexibility of the NMI payment gateway. There are many reasons why a high-risk merchant might need to use multiple merchant accounts. For example, it’s an excellent way to mitigate and disperse risk. The question is how to smoothly manage multiple merchant accounts with Shopify when NMI is no longer supported. The best solution is to find alternatives to both Shopify Payments and the Shopify shopping cart. Luckily, at E-Commerce 4 IM, we’ve found that there’s a way around the compatibility issues that come with NMI and Shopify. Before we dig in, let’s revisit the benefits of using Shopify, as well as using multiple merchant accounts. Shopify offers a great deal of control, excellently balanced with convenience. All high-risk site owners can create a beautiful and unique site. Their drag-and-drop editing tool for design makes this very easy. Additionally, since they’re a publicly traded company, NYSE: SHOP, they also receive a lot of backing that goes into software engineering and security. 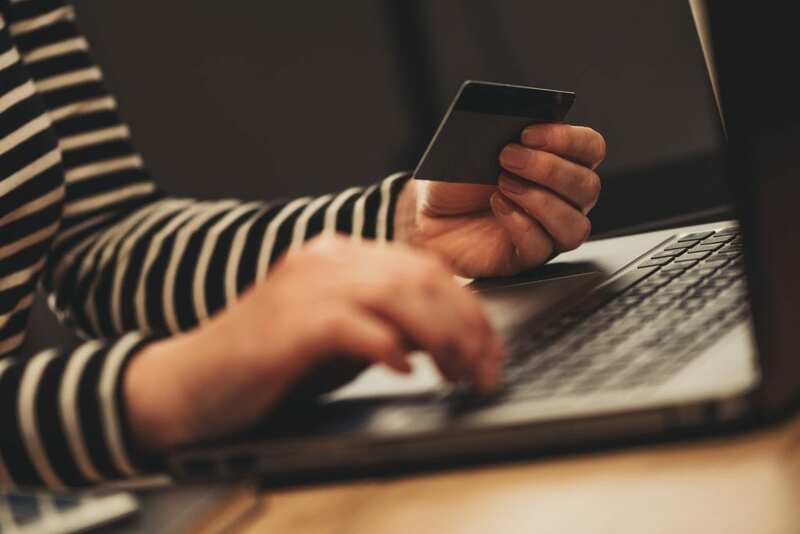 In other words, there are fewer concerns when it comes to the safety of your e-commerce site as you’ll receive an automatic, mixed content free, SSL and additional support and security. On top of this, online shops operating through Shopify are also generally very fast. Speed is paramount not only to ensure a great user experience but also for conversion and SEO. We can offer you support if you’re a high-risk merchant looking to launch your online shop on Shopify. Contact us today, and we can provide you with a high-risk merchant account that fits your product and accommodates your sales volume. You’re probably aware that the various product types or services you decide to sell involve different types of risk. For example, some of your products might be more prone to chargebacks, while others classify as high-ticket sales. This means that if you’re processing payments for different high risk product types with the same merchant account, you’re likely to come across a few problems. The best way to address these issues is by using multiple merchant accounts that fit best with each specific product type. The challenge, therefore, is to be able to manage and access the different merchant accounts using one payment gateway. This is where NMI comes in. NMI is exceptional at providing one login and platform that you can use to access and manage multiple high-risk merchant accounts. If you need merchant accounts for your different products, don’t hesitate to contact us – we can help you with your credit card processing needs. The first step in helping you process payments with multiple accounts through Shopify is to find a way for you to use NMI. CartHook is a very useful shopping cart software that you can install on your Shopify site. At E-Commerce 4 IM, we’re extremely happy with what this software has provided our clients. We’ve even decided to take the next step and become an affiliate of theirs. Please note that the following links to CartHook are affiliate links. What CartHook does is replace the standard out-of-the-box Shopify Payments as well as the Shopify shopping cart. This change might not sound like a lot, but the opportunities this software change provides is pretty brilliant. By using CartHook, you’re using a third party shopping cart. In other words, you won’t end up paying the double transaction fees discussed in Shopify’s pricing list. If you’re currently paying additional fees to run a third party payment gateway, you should know that this isn’t strictly necessary. With CartHook’s shopping cart, you’re free to expand your processing capabilities with greater flexibility, not to mention more benefits. CartHook works perfectly with Shopify and provides a seamless experience for your site’s visitors. 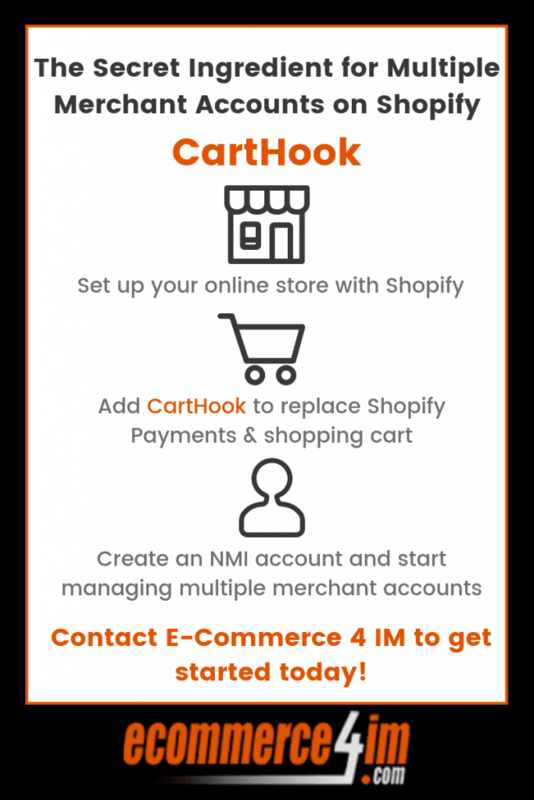 As CartHook replaces both the shopping cart and the Shopify Payments gateway, you’ll be free to integrate your existing NMI gateway with CartHook. The NMI payment gateway will be integrated with the CartHook software and shopping cart. This allows you to truly mitigate any risks associated with your products effectively through the use of multiple merchant accounts. You can do this without having to struggle to find other third-party integrations and approved Shopify native apps. More often than not, they simply don’t facilitate multiple merchant accounts through one gateway anyway. In other words, if you’ve hesitated on setting up an NMI account because you can’t use it with Shopify, you don’t have to hold back anymore! Get your NMI account set up, and we’ll help you with your sensitive data migration. We strongly recommend that you look into using CartHook. There are many more benefits to the CartHook software itself. In addition to enabling the ability to use NMI for your Shopify online store, CartHook also allows for simple one-click upsells and integrates with the landing page and funnel builder Click Funnels. We find that a lot of Click Funnel entrepreneurs also manage a Shopify store, and CartHook allows them to use one gateway for both. If you need assistance setting up an NMI account, feel free to contact us right now. We’re more than happy to help you and to transfer your current Shopify customer data securely to NMI. Of course, if you’re looking for high-risk merchant accounts please let us know. We can provide merchant accounts that are tailored to your specific high-risk product types. You can contact us on our website, or you can always give us a call at 1-800-570-1347.